Studied in Petrozavodsk school, at the end of the course students enrolled in the Imperial Academy of Arts. Studied under p. P. Chistyakov. After graduating at the same time University course on legal faculty in 1872, Polenov went abroad as a pensioner of the Academy. Returning in the same 1876 in Russia, soon went to the Russo-Turkish war, which was the official artist at the headquarters of the heir, Tsesarevich. After the war he settled in Moscow, from there in 1884 travelled to Constantinople, Palestine, Syria and Egypt. From 1879, he was a member of the Association of traveling art exhibitions. 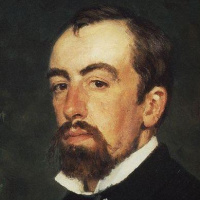 Born Vasily Dmitrievich Polenov in St. Petersburg, may 20 (1 June) 1844 in cultural noble family. His father — Dmitry V. Polenov, the son of the academician of the Department of Russian language and literature, was a famous archaeologist and bibliographer. The mother of the future artist, Maria Alexeyevna, nee Voeikov, wrote books for children and was engaged in painting. A talent for drawing was characteristic of the majority of children of polenovs, but the most gifted were two: the senior son, Vasily and younger daughter Elena, who later became real artists. The children were teachers in painting from the Academy of arts. Meeting with one of the teachers — P.P. 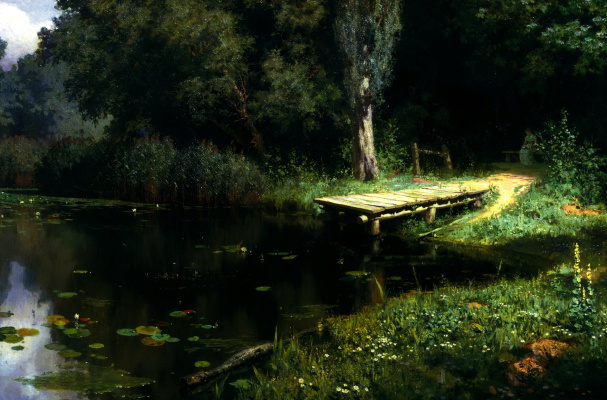 Chistyakov became decisive for the life path Polenov. Chistyakov taught drawing and the basics of painting Polenov and his sister in 1856−1861. At that time he demanded of his disciples close study of nature. 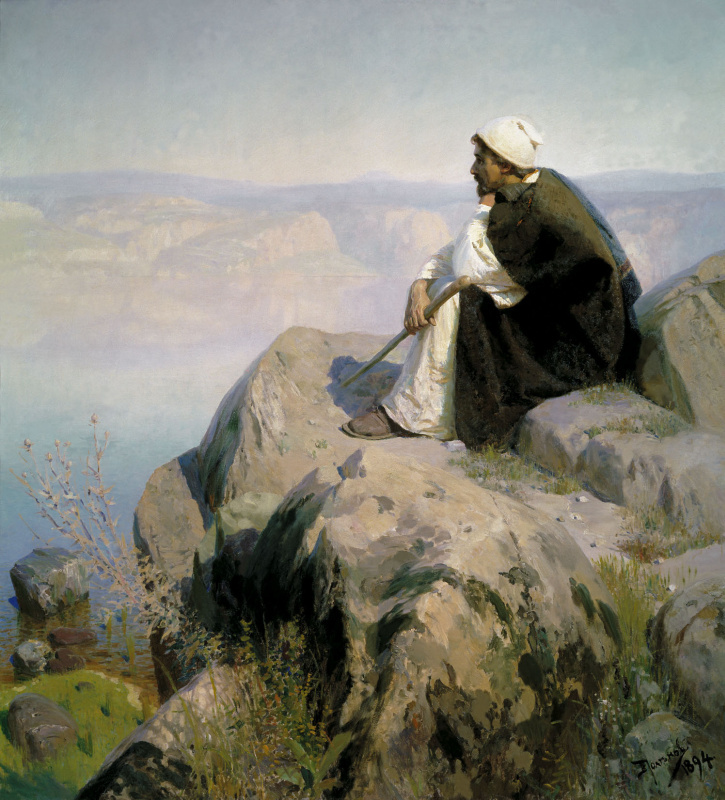 "Nature, " recalled later Polenov, was established for a long time, and the picture was developed systematically, not conditional admission, and careful study and, if possible, by the exact reproduction of nature." "Without thinking, nothing to start, but, don’t hurry", — advised the teacher Polenovo. 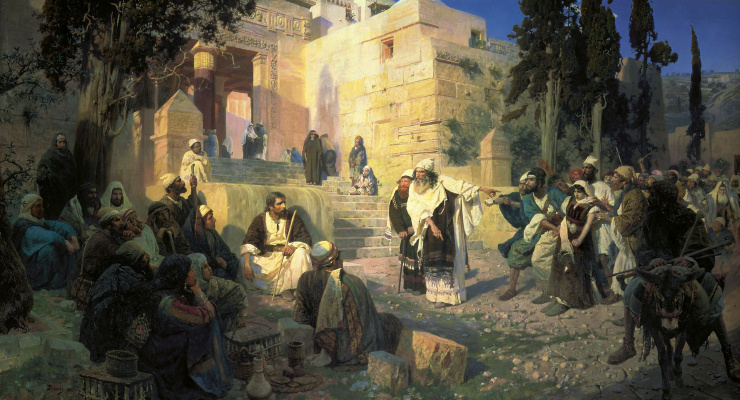 Obviously, Chistyakov was able to convey his disciple important — professional approach to painting, the understanding of what this art can only be the result of hard work and, not least Polenov is able to assimilate. After long hesitation in 1863 he, after graduating from high school, goes together with his brother Alex on physical and mathematical faculty (natural discharge) of St. Petersburg University. At the same time in the evenings as irregular students student he attended the Academy of arts, and is engaged not only in drawing classes, but also with interest listens to the lectures on the subjects of anatomy, the art of building, descriptive geometry, history of fine arts. Do not stop Polenov and music lessons. He not only was a regular visitor to the Opera theatre and concerts, but he was singing in the student choir of the Academy. Clicking in the drawing classes of the Academy of arts as a permanent student, Polenov on time leave the University, completely immersed in painting. Making the right choice, because already in 1867 he finished an apprenticeship course in the Academy of arts and receives the silver medal for drawing and sketch. Following this, participates in two contests for gold medals chosen by the class of historical painting and January 1868 again becoming a University student, but now the law faculty. In 1871 he got the diploma of lawyer and, at the same time with Ilya Yefimovich Repin, the large gold medal for competitive painting "the Resurrection of Jairus ' daughter". Polenov strives to create a work of high style, to give sublime nature shows, workshop layout and color solution, she wore features of the genre, but there was no improvement in the thought of this picture. Many noted greater heat feelings expressed Polenov in the way of the girl, pulling slender hand to Christ. However, it took another few years before Polenov really found myself as an artist. Vasily goes on for a long time to train to Paris, and wrote on there, among other things, a picture of "the Arrest of the Countess d Acreman", which allowed him to run in 1876, the title of academician. 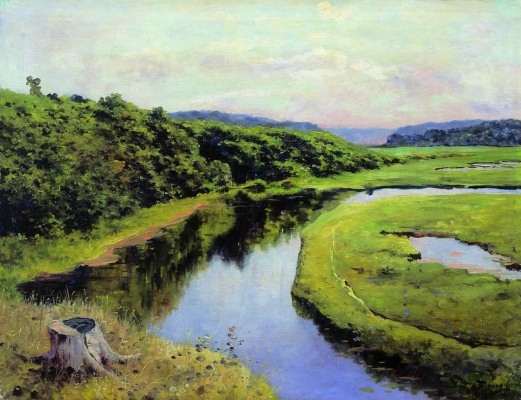 Realistic aspirations of the artist, ukrepleniia under the influence of I. Repin and A. bogolyubov, fully manifested in his thin plein air landscapes and studies. 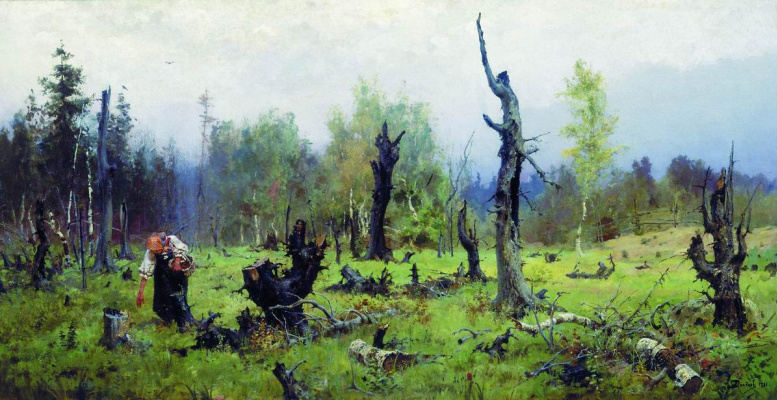 After returning home Polenov becomes a staunch supporter of the national democratic art. He writes is true, full of love to the people of portraits of the narrator of folk tales Bogdanova (1876), a country boy of Kahramaa (1878), a picture of peasant life "Family tragedy" (1876). Back in 1876 in Russia, soon went to the theater the Russian-Turkish war, which was the official artist at the headquarters of the heir, crown Prince (later Emperor Alexander 3). After the war he settled in Moscow. After a lot of traveling. The most strong impression on him "Vепеziа La Ьеllа" (the beautiful Venice), introducing themselves (in his words) "praesumo traveler fantastic, some magical dream." The rapture Polenov Venice was intensified because it was the birthplace of his favorite artist Paolo Veronese conquered it in the period of teaching at the Academy of arts. Since then, the passion Veronese not passed, becoming, from year to year increasingly meaningful and purposeful. Polenov with him the makings of a colorist was amazed at the huge color gift Venetian artist, the power of his paintings. "What subtle sense of paints — admired Polenov, — what an unusual ability combinations and selection of colours, what is the power in them, which are free and widely deployed composition, with all this ease brush and work, as I am no one you know!". Bowing to the beauty of colour paintings Veronese. After proceeded to Rome, but he had disappointed him. "The city of Rome itself… some dead, backward, now defunct, — shared his observations Polenov Repin. — There he is … how many centuries, and even typicalness no, as in medieval German cities… No life in it a kind, own, and all he seems to exist for foreigners… About artistic life in the modern sense, and Pomino no, artists lot of sense; are all closed, every nationality separately from the other, studios them though unlocked, but mainly again to rich overseas buyers, so and art are adjusted to their taste… Roman artist his first picture is a routine impersonator. Old Italians me too, not a lot…". Therefore, in Rome, there was created a single picture. The period of a pensioner’s trip helped Polenovo to understand that not historical painting is his real element. Eyes Polenov completely turned to the landscape. This was the result of its research abroad. Humanistic talent Polenov finally revealed in its full force and discloses on Russian soil, and discover that their Russian warehouse. He had, after acquiring plein air painting to achieve polnotsvetnoy and richness of colors, their emotional richness, which was achieved in the following the "Moscow courtyard" the works written with all the glitter scenic skill — pictures "grandmother's garden" and "Overgrown pond". 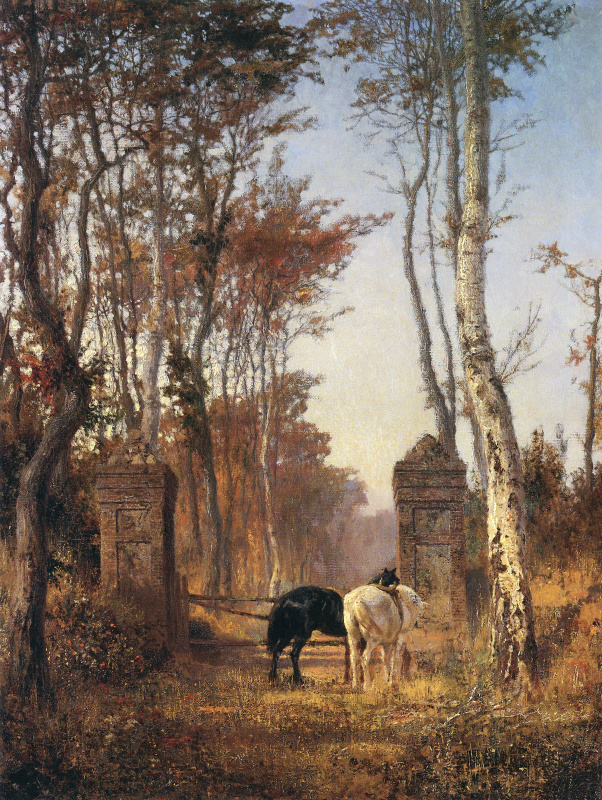 For example, the painting "Granny's garden" was exhibited at the VII Traveling exhibition in 1879. In a review of the exhibition Stasov called "grandmother's garden" among the best of things, noting it with "fresh tones" painting. She is really, first of all, conquers by painting. Her ashy-gray with purple and blue iridescence, pale pink, sand, silver-green various shades of colors, harmonically combined with each other, form a single color range. The image created in the painting by the artist, deprived not only one-way; it is the natural and harmoniously combines different aspects of life perception and comprehension of it. 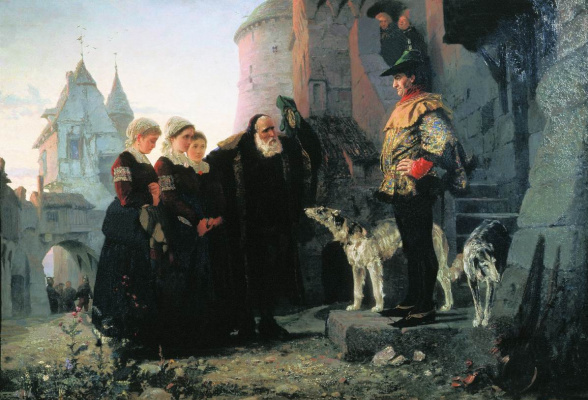 Depicting the old manor house and its old owner, Polenov, unlike Maksimova with his painting, "All in the past, nothing tells the audience about the style of this life. Merging with nature, which shows here Polenov, depicted in common with the inhabitants of the Moscow courtyard. They both live quietly and naturally, the life of nature that gives them meaning and poetry. This feeling of harmony and beauty of life evoke in the viewer light calmly happy mood, which allowed his elegiac meditation on the scene, captured by the artist. But the picture "Moscow courtyard" is the first picture Polenov, exposed at the Peredvizhniki, the case which he had long been sympathetic. To his debut at the Peredvizhniki, the artist treated with great sense of responsibility and therefore terribly worried that because of lack of time gives the exhibition a "minor" thing as "Moscow courtyard", written as if jokingly, by inspiration, without serious and long work. "Unfortunately, I had no time to do greater things, and I wanted to play on the mobile exhibition with something decent, I hope in the future to earn the lost art of time," complained Polenov. 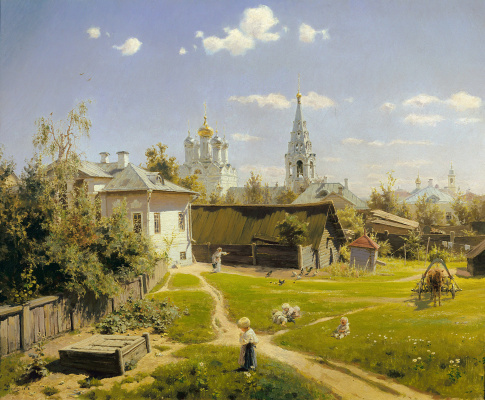 However, Polenov correctly estimated the picture, not knowing what future awaits it is a work that she will be among the pearls of the Russian school of painting, will become a landmark work in the history of Russian peizaja this picture, the author has reproduced the typical area of old Moscow — with its mansions, churches, covered with green grass yards, with its almost provincial lifestyle. Morning bright Sunny day in early summer (memories of the artist). Easy to glide through the sky clouds, all above the sun rises, warming his warmth the earth, sparking silver sparkle domes of churches, shortening the dense shadows… Patio comes to life quickly goes to the well, a woman with a bucket, busily digging in the ground of the shed chickens, contrived a fuss in the thick green grass children, is about to get under way in the way of harnessed to a cart horse… This everyday vanity does not violate serene clarity and silence. 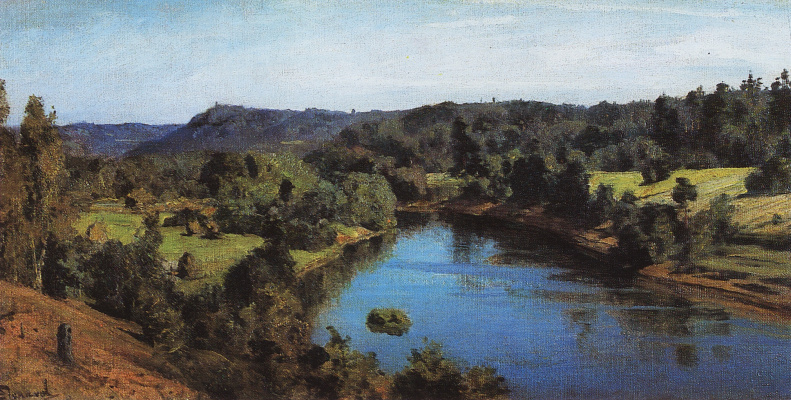 In the further development of Polenov-landscape in the age of 90 years, is inseparably connected with his life on the Bank of the Oka, which became in these years an inexhaustible source of creative inspiration. Hoping to settle "on the nature", Polenov purchased in 1890 a small estate "Behave" in the former. Aleksin district, Tula province. There he built on his own project house with workshops for friends-artists. The estate was named "Borok". The choice of a new place to live happily coincided with the direction of creative search Polenov 90-ies and we can say that in many respects promoted success of these searches. Nature area favored the development of Polenov attraction to epic landscape. The artist quickly found his subject in the landscape, and from that moment became a real poet of the Oka. The last years of life Polenov held in Borok. 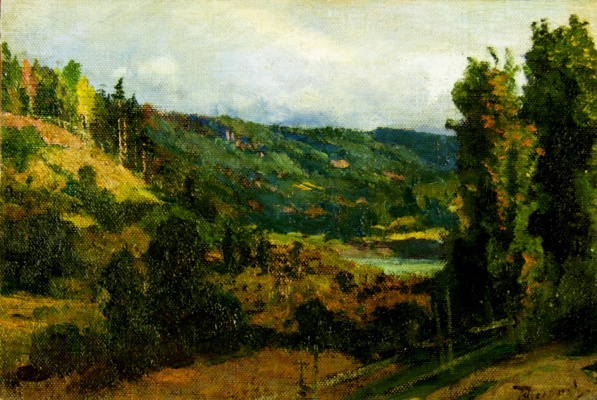 He continued to work constantly inspired by the landscapes of the Oka, which were written many landscape master, he collected art collection for the opening of a public Museum. Now there is the Museum-estate of C. D. Polenov. Eighteenth July 1927, the artist died in his estate, and was buried at the cemetery in Behove.